The servitization megatrend is upon us. Will manufacturers ride the servitization wave to greater profitability? The servitization megatrend is upon us. Product-driven companies are adding services revenue streams and business models, usually to augment but sometimes to replace product-based business. What is servitization, and why is it happening? When a major change or megatrend happens, there is usually not just a single reason. Multiple forces push a culture, society or economy inexorably in a single direction. Servitization is driven in part by limited opportunity for many product-centric companies to grow in terms of product revenue and profits—due to factors like downward price pressure, volatile demand and increasing prices for inputs and raw materials. In other markets like machine tools, lumpy year-over-year business may make the stable, recurring revenue of services attractive. Aftermarket services may also make the customer more dependent, as they push off important value-added services like maintenance, operation and asset lifecycle management onto the supplier. This may insulate the vendor from competitors. It also enables a vendor to access deep insights on how their customer is using their products, which can in turn drive a consultative selling process. But enabling technologies are also making servitization more feasible. The internet of things (IoT) is enabling companies to sensor products they sell and use the resulting data stream to automate everything from re-order to dispatch of a service technician. A recent report from McKinsey suggests that while margin on new product sales is typically 10 percent, aftermarket service margin averages 25 percent. But actually realizing that revenue poses some significant management and enterprise software problems. Executives will need to live increasingly in the mental future—planning around not only the product lifecycle but the service cost and revenue cycle. When the service agreement is sold, a company will be committing to deliver against a contract that they could make or lose money on for years. 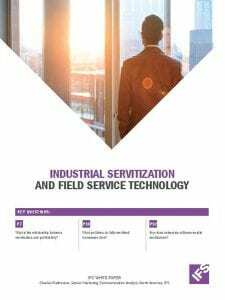 Now, a 2018 IFS study of 200 North American manufacturing and industrial executives delivers insights into the extent of servitization and its impact on profitability and the extent of their adoption of service lifecycle and field service management technologies. Among respondents to the IFS study, the majority had some type of aftermarket revenue stream, even if that revenue stemmed strictly from aftermarket parts sales. The smallest segment were those who had servitized completely—essentially doing away with product revenue and charging for a product by duty cycle, usage or some other metric. 38 percent of respondents sold only products, with no aftermarket or other service revenues. 19 percent sold products and some aftermarket service parts. 15 percent sold products and aftermarket field service through break-fix repair. 16 percent sold planned maintenance contracts with service level agreements (SLAs).